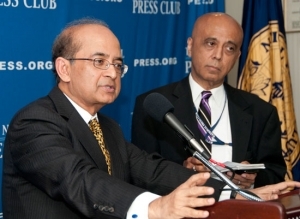 Rajat M. Nag speaks to a Newsmaker press conference as host and organizer Tejinder Singh looks on. Rising inequality and the absence of good governance are the main challenges to Asian growth and could eventually derail it, Rajat M. Nag, managing director general of the Asian Development Bank, told a May 22 Newsmaker. Two more immediate hurdles lie in the Euro crisis and oil prices, he said. Nag said the current picture is basically positive with "robust growth rates." The ADB is forecasting Asian economic growth of 6.9 percent this year, down from 7.2 percent last year, but expected to reach 7.3 percent in 2013. Over time, there has been a "historical transformation" from 1970, when half of Asians lived in poverty, to 1990, when one-third did, to 2005 when one-fifth did, he said. The region is "rebalancing" toward internal demand rather than dependence on exports to its two main customers, the U.S. and the Euro area, he said. "Asia cannot be just a factory Asia but over time must become a consuming Asia," he said. In contrast to the picture of "glitzy towers" of Asia, which he said is real, there is another face, which he said is just as real. Two-thirds of the world's poor live in Asia and 700 million people have no access to clean water, he said. In addition, 83 million children under 5 are underweight, which means that they are "doomed for life," he said. The two faces of Asia are diverging as inequality is rising, he said. He cited ADB research that estimates if income distribution had remained constant during the growth of the past two decades, 240 million people would have been lifted out of poverty. "It is not to rain on the party" because the Asian story is one to be proud of, Nag said, even as he urged Asian policymakers to address the issue of inequality. He named good governance, including the reduction of corruption, as the other critical challenge to Asian growth. The ADB addresses this issue in three ways: by building accountability safeguards for the funds used in its own projects, by fostering audit capacity in countries lacking it and by talking about it, he said. Good governance requires both niti, the Sanskrit word for rules and regulation, and nyaya, the Sanskrit word for justice, he said. He said two trends could help Asia. Population growth could be a "dividend" if people are provided with the necessary education and institutions, but it could also be a "demographic curse" without the policies, he said. Likewise he said that urbanization can help if the proper services are provided. Services can be more easily provided in urban areas because of "economies of scale," he said.